If you wish to donate Anonymously or via check, please send your contribution to: UMVA Maine Masters, c/o Jackie Bennett, Treasurer, PO Box 51, Walpole, ME 04573. Indicate “Shetterly” in the Memo Line. Robert Shetterly discusses his ideas behind his project, Americans Who Tell the Truth. ROBERT SHETTERLY: An American Who Tells the Truth is a documentary film about this political artist and activist, who has created a portrait series entitled Americans Who Tell the Truth of 238 courageous Americans. Scratched into each portrait is a quote focusing on how to build a truly democratic and just society and what we need to do now to survive. As Shetterly travels to communities and schools across the US, the portraits provide models of courageous citizenship. This film is sponsored by the Union of Maine Visual Artists, a 501(c)(3) not for profit educational organization. All donations are tax deductible. Read more. Louis Clark, defender of whistle-blowers, discusses his work with Robert Shetterly. Dr. Mona Hanna-Attisha, the whistle-blower who sounded the alarm about the high presence of lead in Flint, MI drinking water, demonstrates still no clean water. This panel discussion also features Richard Bowen, the Citibank whistle-blower and Robert Shetterly. Robert Shetterly’s portrait subject Richard Bowen, Citibank whistle-blower, discusses how “in the banking community there is no downside to fraud”. This scene in the classroom of Professor Mara Sapon-Shevin reveals her ideas on American education and why Shetterly chose to paint her portrait. It also features educator/activist Bill Ayers. 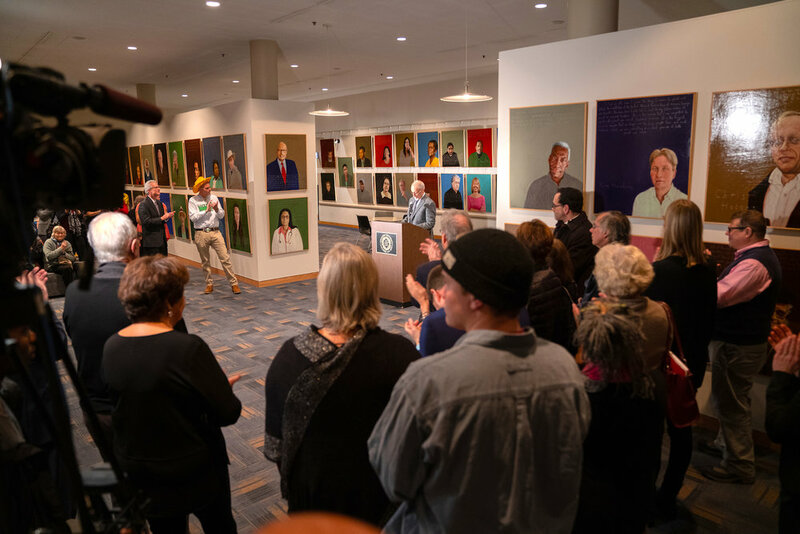 Recent exhibit of Robert Shetterly’s 238 portrait’s sponsored by Syracuse University’s Maxwell School of Citizenship and Public Affairs. Robert Shetterly addresses the group at the Panasci Lounge at Syracuse University where his exhibit of 238 portraits of his Americans Who Tell the Truth were recently displayed. Curatorial staff at Syracuse University mount portrait of Terry Tempest Williams. James Clark, Professor of Theater Management at Syracuse University, addresses group gathered for the opening of Americans Who Tell the Truth exhibit.